A decision on whether Texas' state-based immigration enforcement, Senate Bill 4, will be put on hold could come later this week. But even if it's temporarily halted, the matter is far from over. By Friday, Senate Bill 4, a state immigration-enforcement law that would outlaw "sanctuary" jurisdictions in Texas, will either go into effect or have been blocked by a federal district judge. But advocates on both sides are bracing for the court fight to potentially linger for years. The law would forbid police chiefs, sheriffs, constables and other jail administrators from preventing an officer to ask about a person’s immigration status during an arrest or lawful detention, or from sharing that information with federal officials. It would also require that jail officials honor all requests from Immigration and Customs Enforcement officials to hold an inmate for possible deportation. It doesn’t apply to public or charter schools or hospital districts but does pertain to public colleges and universities. Gov. Greg Abbott signed the law in May, and it is scheduled to go into effect Friday. But opponents of the measure, including the cities of Houston, Austin, San Antonio and El Cenizo, as well as Maverick and El Paso counties, have argued the law violates several provisions of the U.S. Constitution and filed a lawsuit against Abbott and Attorney General Ken Paxton in San Antonio in hopes of blocking it. They are asking U.S. District Judge Orlando Garcia to temporarily halt the bill while the debate over its constitutionality plays out in full. If Garcia declines to make a ruling, the law will go into effect. But even if he agrees with SB 4’s opponents, the litigation is expected to drag on, said Shannon Edmonds, the director of governmental relations for the Texas District and County Attorneys Association. Lawyers for the state of Texas and the U.S. Justice Department told Garcia in June that the constitutionality of state-based immigration enforcement has already been settled. That happened, they argued, when the high court ruled in 2012 to let part of Arizona’s controversial Senate bill 1070 stand, including the part that allows officers to ask a person’s immigration status if they have a reasonable suspicion to believe the person was in the country illegally. But Lee Gelernt, an attorney with the American Civil Liberties Union representing the city of El Cenizo, said the Arizona statute specified an officer needed reasonable suspicion before making such inquiries, and the Texas law has no such requirement. Edmonds also said the law is unprecedented as it includes the provision that allows for elected officials or high-ranking law enforcement officials to be charged with a class A misdemeanor and possibly removed from office for not complying with the law. “Officials can or can’t tell their employees what to do, which is very unusual – we couldn’t really think of anything similar in existing law,” he said. As the case plays out in Garcia’s courtroom, immigration attorneys say federal enforcement of immigration laws are likely to keep being ramped up while President Donald Trump remains in office. 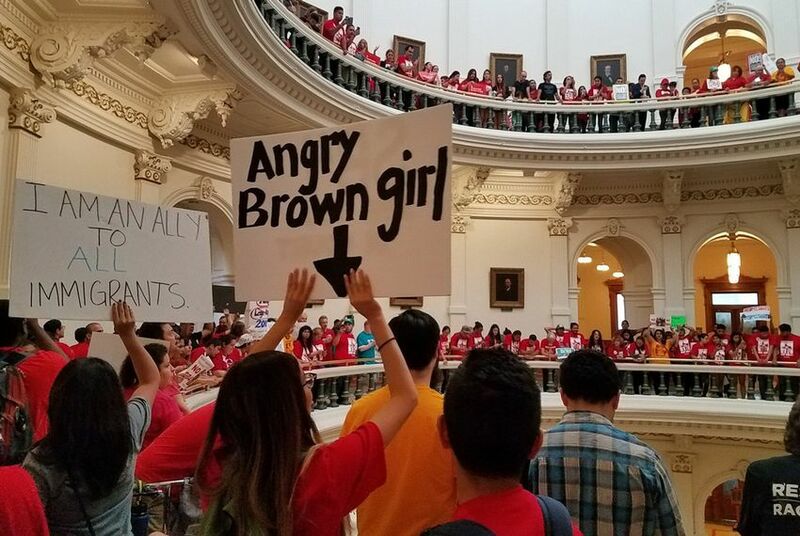 Meanwhile, state Republicans have been firing back at what they argue is misinformation about the bill that has only served to strike fear in the hearts of Texans. After the city of San Marcos voted last week to file an amicus brief in support of El Cenizo and the other litigants, state Rep. Jason Isaac, R-Dripping Springs, blasted the move — and how the media has covered it. “Although this law has been vilified in the media, the facts reveal that SB 4 is a reasonable measure to ensure truly violent criminals are kept off our streets,” he said in a statement. Democrats are arguing that if it's not blocked, implementation of the law should at least be delayed until Texas is back to some sense of normalcy after a week of being ravaged by Hurricane Harvey.